Looking for an Infrared Sauna in Atlanta? People visit wellness and beauty centers for benefits that go much deeper than the top layer of skin. Today's centers offer comprehensive holistic therapies that address every aspect of your physical needs. Many of them are well equipped with colon hydrotherapy, kinesiology, infrared saunas, paraffin treatments, and more. A premiere example of this is Atlantic Colonic and Massage, a beauty and wellness center located in Alpharetta, Georgia-just outside of Atlanta-that puts a team of dedicated health professionals at your beck and call to apply effective treatments that enhance and improve your corporeal self. Atlantic Colonic and Massage's wide range of services were established initially with colon hydrotherapy to rid the body of toxins and also offered therapeutic massage to the soft muscle tissues such as muscles, ligaments, and tendons. These days you can also enjoy infrared sauna in Atlanta, which in itself offers a variety of benefits. People's interest in infrared sauna treatment creates a natural market demand for this service, and this spa, along with many other health and wellness centers, responds to that demand with an economically feasible service. Those who wish to experience an infrared sauna will find it available within their own communities at an ever-more affordable tug on the pocketbook these days. An infrared sauna is a welcome adjunct to a luxurious regimen of attentive spa care, but the best advice is to try one and experience its benefits before you decide to lay out your hard-earned cash. That's why it's important to include an infrared sauna session as part of your next visit to a wellness, beauty, or fitness center, to learn how it works for you before you buy one. At Atlantic Colonic and Massage, the center of attention is on preventative health care and detoxification. And based on that focus their well trained staff determined that the infrared sauna was the next logical addition to the package of services they offer. The staff members maintain an excellent standard of continuing education training, and their dedication to spreading knowledge about these healing arts-many of them gathered from ancient cultures-speaks to their devotion to their clientele. The interest in infrared sauna treatments arises out of the benefits of a centuries-old Finnish tradition that provided many benefits. The CEO of Atlantic Colonic and Massage, Teresa Ducoffe, began her career in alternative medicine as a licensed practitioner of therapeutic massage. As her career took her in a different direction, she expanded her interests into additional therapies such as hydrocolonics, nutritional supplementation, and musculoskeletal manipulation. With her focus on natural ways to detoxify the body, use of the infrared sauna was the next logical step. You will find that the infrared sauna in Atlanta is a perfect complement to colon hydrotherapy as a powerful detoxification mechanism. While colonic hydrotherapy cleanses the body of inert digestive toxins, the infrared sauna enables the body to eliminate a whole different complex of toxins via the pores of the skin. The skin is the largest organ of the entire body, and it does far more than just protect what's beneath it. The skin regulates the body's temperature and lets the body breathe. When you take an infrared sauna, its heat penetrates from 1.5 to 3 inches deep within the skin, all the way into muscle tissue, to purge these impurities. That's why it's so important to take a shower after an infrared sauna-to rinse away the impurities that you've just expelled through your pores. 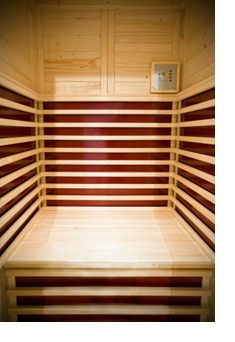 The infrared sauna in Atlanta reaches effective temperatures at 100-130 degrees Fahrenheit. This is much cooler than the range necessary for old-fashioned saunas that get as hot as 180-220 degrees. And the heat of the infrared sauna does not dry out the delicate tissues of your nose, mouth, and other mucous tissues. That makes it easier on your lungs, as well. Because it works by helping your body to produce heat of its own, it will cause you to produce up to three times as much perspiration-that's more toxins out of your body!-and it also stimulates your cardiovascular system. Your heart beats faster, and with repeated sessions your blood pressure will drop. The increase in your blood circulation causes your body to burn hundreds of calories per session. In addition to the cleansing and cardiovascular stimulation, it is also a very relaxing process. It becomes clear, then, for those who are interested in holistic body purification and detoxification: If you have practiced colon hydrotherapy, sought customized nutritional supplementation, or considered similar methods to achieve purity and tranquility, then the infrared sauna must be a part of your weekly regimen.